BEST VALUE! WORLD'S BEST KIT! Another exclusive item. This Randakk Master Carb Overhaul Kit for Honda GL1000 includes everything you need (and nothing you don't need!) for a comprehensive GL1000 carb overhaul. This kit is proprietary to Randakk's...you won't find this available anywhere else at any price. Sourced for the best available parts from 3 continents and combined them with exclusive items to make this kit possible. 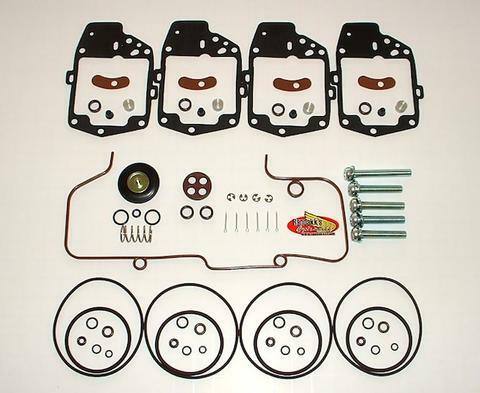 This kit is appropriate for any 1975 - 1979 GL1000 with original carbs. Did you know that one good case of severe engine overheating can ruin the carb o-rings found in ordinary kits? My o-rings are the best available! Viton Proof. Also, my o-ring sizes are quite precise. They are equivalent to the exact sizes specified by Honda for each fitment. Not "close-enough" sizes as in many of the other aftermarket kits I've evaluated. All GL1000 Master Kits supplied by Randakk's Cycle Shakk have fiber-reinforced float bowl gaskets to prevent problems associated with non-reinforced float gaskets. Some non-reinforced gaskets have proven to be reactive with some gasoline formulations and can sometimes swell to the point that float operation can be adversely affected. Fiber reinforced (calendarized) synthetic rubber overcomes these issues. To be safe - avoid all non-reinforced GL1000 float bowl gaskets. These are still being sold by other vendors. Each kit provides everything listed for all 4 carbs + other items required for splitting and rejoining the plenum plus overhauling the air cut-off valve. Only the highest quality items are included. This kit has been thoroughly tested and approved by the world's leading authority on GL1000 carbs (me). This collection represents the best value available in the market. Trust me, you will need everything in this kit to do a proper overhaul of your carbs. Note: Aftermarket main jets are sometimes not sized properly...the O-ring grooves can be too shallow. This results in the O-ring fit being too snug. "Dress" the jet tower cavities with crocus cloth or similar to remove oxidation and burrs, then use lubricant like Vaseline to insert the main jets. Randakk's Viton carb-to-plenum fuel seals. 4 are provided. See detailed description below. Randakk's exclusive improved Viton GL1000 plenum gasket. Randakk's exclusive carb "pucks." See detailed description below. 5 - Special screws and lock washers in 2 lengths to rejoin the plenum halves. These are high quality zinc-plated screws...not soft crap like the originals. My kit includes everything you need to separate and rejoin the plenum: plenum gasket, special carb-to-plenum fuel seals, carb-to-plenum "air seals" as well as 5 high quality screws in the correct lengths. If you don't split the plenum and renew these critical parts during your overhaul, you may have regrets later. Note: No jets or jet needles are supplied with my kits. My experience is that these can normally be cleaned and reused. Aftermarket needles are not sized as accurately as the OEM needles and may introduce lean / rich problems where none existed. Unless your needles are worn or bent, I recommend reusing them. If you try to buy jet needles from Honda, you'll discover that they are only available as a set which includes the CV slide, cap and jet needle. The price will make you faint! If you need jets, buy aftermarket kits from a supplier such as Sirius (you'll still need my kit). Also, there are no float valve/seat assemblies in my kit. Many aftermarket rebuild kits include float valve/seat assemblies of dubious quality. In the past, there have been many problems with these aftermarket items. Most of the problems related to the aftermarket float needles being incorrectly sized (too short) resulting in unreliable (or nonexistent) fuel shutoff. Some are OK. I've not included them in this kit, because the rubber tips and seats on the OEM item will last nearly forever and can usually be cleaned and reused so long as you install a new O-ring which I have included. So, I've left float valve/seat assemblies out of my kit to keep the cost down and give you a choice on what to buy if you think new ones are needed. If you decide that you need new float valve/seat assemblies, you can buy the OEM item and not have a worry. This way you'll also get new fuel inlet screens (the plastic strainers installed below each float valve). The Honda part number for the float valve set is 16011-371-014 (supersedes 16011-371-305 which superseded 16011-371-004). It includes the float seat, float needle, O-ring and screen. You will need to order 4 of these. There is no worry about getting the wrong part from Honda. Their system will always supply the correct superseded part regardless of what you request. Or, take a slight gamble and go with aftermarket float valve/seat assemblies which are available at reasonable cost from numerous suppliers. When you use aftermarket float valve/seat assemblies you will need to carefully remove, clean and reuse your existing fuel inlet screens. No fuel filter is included. But, it would be a crime to redo your carbs and not take prudent measures to ensure a pure fuel supply! I recommend the OEM Honda filter as a high quality replacement unit. The Honda part number is: #16900-371-004. We now offer the optional Randakk High Performance Fuel Filter with sizes to fit virtually any carbureted motorcycle. Details here. While you are at it, you should replace your fuel hoses as these can sometimes disintegrate from the inside out and be a source of fuel contamination in the form of small rubber fragments. I recommend that you purchase a length of high quality 1/4" fuel injection hose locally. You will need 3 sections: 1 piece 160 mm long and 2 pieces 150 mm long. The long piece goes from the fuel pump to the carbs...the short pieces go on either side of the fuel filter. Don't forget to flush your fuel pump. Debris can collect here as well. Total for OEM Honda parts (41 individual parts) =$219.60 at list!!! (Note: In fairness to Honda, their "packing set" contains 1 part that I don't provide...CV carb slide top to carb body plastic "bumper" rings. Honda is the only source I know of for this particular item. However, these last nearly forever. My Master Kit includes 68 total pieces (I count the air cutoff overhaul kit as only "1" piece in my total count even though it actually has a diaphragm, spring, 2 o-rings for sealing the air cutoff valve to the plenum + top cover O-ring. Depending on my supplier, the air cutoff kit might also include another special seal you won't use in this application. Also, I don't count the 5 lock washers for the plenum screws in the total part count). Considerable skill is required to install this high quality kit correctly. Since I can't control this important variable, there is no warranty on these. Rest assured that they are of the highest quality materials and workmanship. Each kit has been carefully packed and inspected to ensure that all items are included. Warning: Please open the package very carefully when it arrives. Many of the parts are very small so take appropriate precautions. If you chose to open the package in the dark over your gravel driveway, after 1 or 12 beers, please don't later complain that you are a "few o-rings short." Seriously, do be careful when you open the package!